← Marathon swims this year…..just to mention a few…. Páraic Casey, Craig Morrison, Jennifer Lane and Rob Bohane are heading off to Dover this weekend to await their window to swim the English Channel next week. In the photo above are 7 of this years aspirants: Roisin Lewis, Carmel Collins, Jen Lane, Rob Bohane, Craig Morrison, Páraic Casey and Catherine Sheridan. Wednesday offered us a sunny evening in Sandycove to see our swimmers for the last training swim before departure. 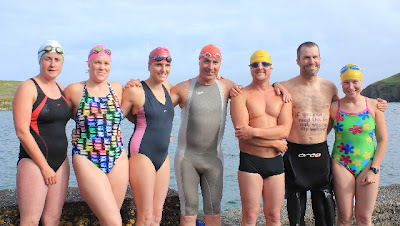 These swimmers (and the rest of the gang going in August) have trained hard all winter and through very tough conditions in Sandycove this Spring. They are far more than aspirants in my eyes. They have already proved they are the toughest physically and mentally, and have won the respect of many at home and abroad. Páraic, Craig, Jen and Rob – know that we are with you in spirit!! Enjoy reaching France! !